LG has released details about the first smartwatch to be powered by Google’s Android Wear OS. The smartwatch market had a pretty rough start, but the same can be said for numerous other segments/projects that experienced slow beginnings but eventually went on to great success. In the past couple of years or so, a handful of smartphone manufacturers have taken a shot at the smartwatch market, including Sony and Motorola. Samsung also created its Gear series last year, and earlier this year the Korean tech giant has moved from the forked Android OS to Tizen, with its new Gear 2 series. 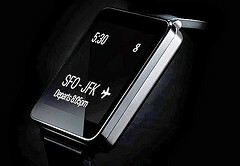 The smartwatch market is expected to have a much greater presence in 2014, now that Google is directly involved in developing a wearable-centric ecosystem – a.k.a. Android Wear. Several tech giants have already signed up to deliver the necessary hardware that will carry the Android Wear platform to the masses, including Motorola, Samsung and LG. In fact, LG is reportedly going to be the manufacturer to release the first Android Wear-powered smartwatch on the market, dubbed the “LG G Watch.” The wrist device was announced shortly after Android Wear became official, back in March, and since then there have been a handful of reports hinting at the G Watch’s whereabouts. Read on to learn about what we know so far about LG’s first smartwatch. Sure enough, last month LG made the G Watch official, and announced that the smartwatch in question will be the first Android Wear gadget to hit the shelves. Not much has been unveiled in regards to the gadget’s hardware specifications, but it is believed that the device will feature a 1.65-inch display and 4 GB of internal storage. This brings us to the next topic, which is the G Watch’s design. Much like Motorola did with the Moto 360, when LG announced the G Watch, the Korean manufacturer also published a render. However, unlike the Moto 360, the G Watch employs a rectangular design which, unfortunately, appears to be missing any kind of “wow” factor. The company then released a new render on its official Facebook page, and roughly two weeks later, the guys at Pocket-lint got their hands on a handful of pictures, depicting a G Watch prototype from all angles. From these pictures we’ve learned that the G Watch is indeed going to be built out of plastic; that it will have a replaceable band, and that it will lack physical buttons of any kind. While the aforementioned publication said that the smartwatch felt solid and “premium,” the pictures and the bland overall design don’t seem to do justice to these claims. In any case, LG picked up the slack just a few days ago, unveiling a few more details surrounding the G Watch on its official website. Specifically, the Korean manufacturer revealed a new flavor for the gadget, dubbed “Champagne Gold.” The model in question seems to employ a white strap, a gold body and a black front panel. In addition to the Champagne Gold flavor, LG also shed a bit more light on some Android Wear features and certain specifications surrounding the wrist device. This includes an “always on” display, the presence of the “OK Google” voice-activated search function, and the fact that the wearable will be water and dust resistant. According to the latest reports, the LG G Watch could hit the market shortly after the next Google I/O press conference, which will be held between June 25 and June 26. During the event, Google is expected to discuss Android Wear in greater detail. Previous rumors have also indicated that the G Watch might go on sale in the U.K. earlier than July, and that the smartwatch’s price in the region will be less than £180 (about $300). That’s all for now, but more details are bound to surface before Google opens the doors at the I/O event in San Francisco, California. Until then, we invite you to share your thoughts and opinions about the LG G Watch in the comment section below. Would any of The Diplomat’s readers be interested in purchasing LG’s first smartwatch?